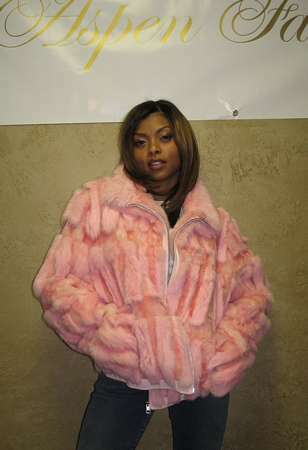 Taraji Henson wearing the Pink Rabbit Jacket, Model 269P. Taraji Henson move credits include Hustle & Flow, Hair Salon, Baby Boy, All or Nothing, Streetwise. TV appearances include Holla, Murder She Wrote: The Last Free Man, All of Us, Felicity, ER, Pacific Blue, Sister, Sister, Smart Guy and Strong Medicine. Voted one of "The 10 Sexiest Women of 2001" by the readers of Black Men Magazine.